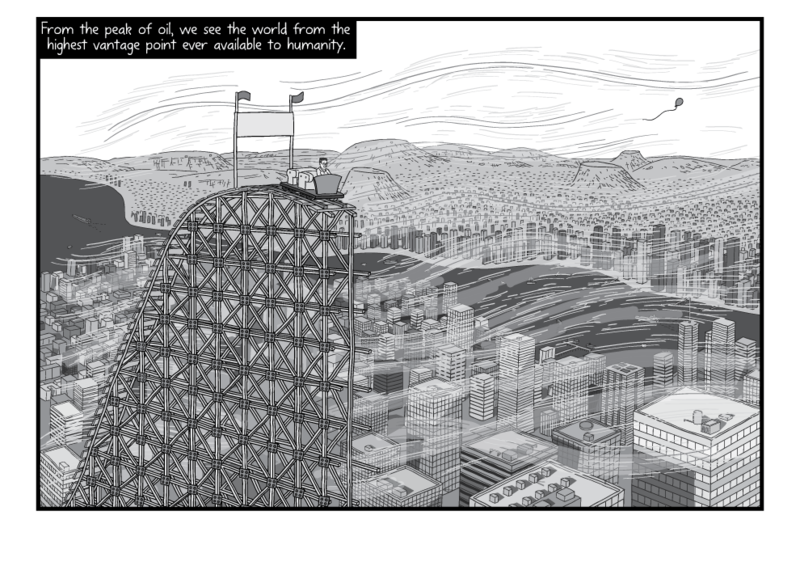 This is the second in a seven-part series covering various aspects of the Peak Oil comic’s creation process. I have been aware of Peak Oil as an issue for 10 years. But it is only now that I feel I have the storytelling ability to tackle such a big and important topic. 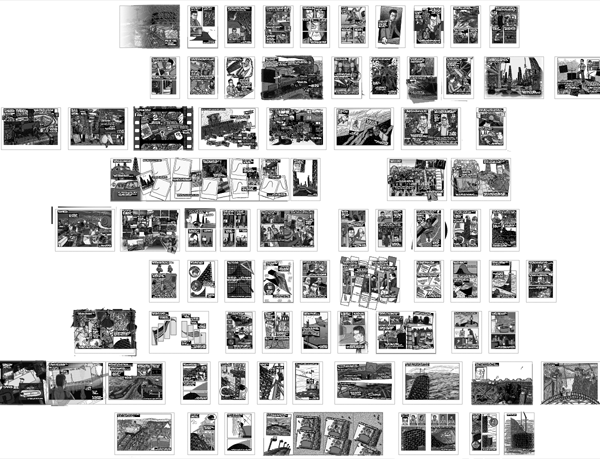 I allowed myself a lot of space to tell the story, rather than trying to fit it into the same space of my previous comics, which had all been 8-40 pages long. 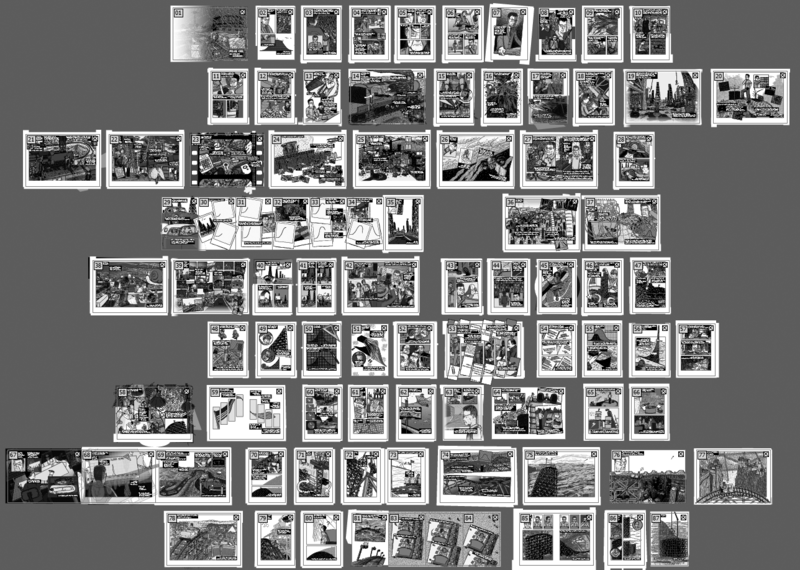 Although my previous comics gravitated towards low page counts, I felt that 120 pages would be the appropriate length with which to adequately cover Peak Oil in a comic. This avoided the problem that many writers and film-makers face when they try to explain the Peak Oil concept in a rushed way. I avoided following their footsteps and making the mistake of cramming too much information into too small a space. I allowed room for the story to breathe, which gave me the luxury of scenes like p98-9, p100-01, and p102-03, which each feature just a single sentence across each of the three double-page spreads. Those three sentences would have had far less impact if shoved onto a single, condensed page, similar to p59. Spacing is a key element of comics. 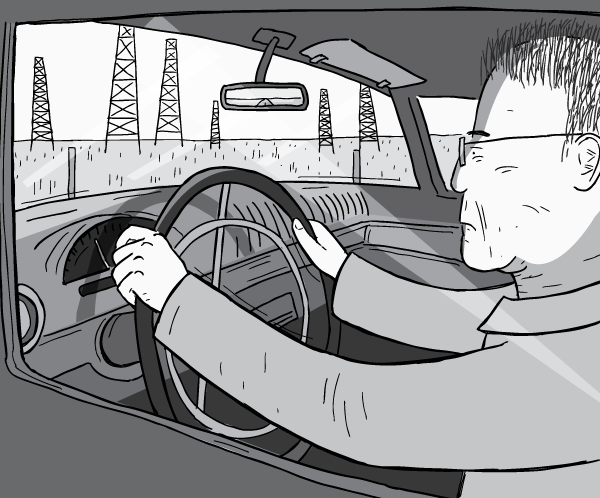 I decided to tell the Peak Oil story with M. King Hubbert as a recurring character throughout the comic. 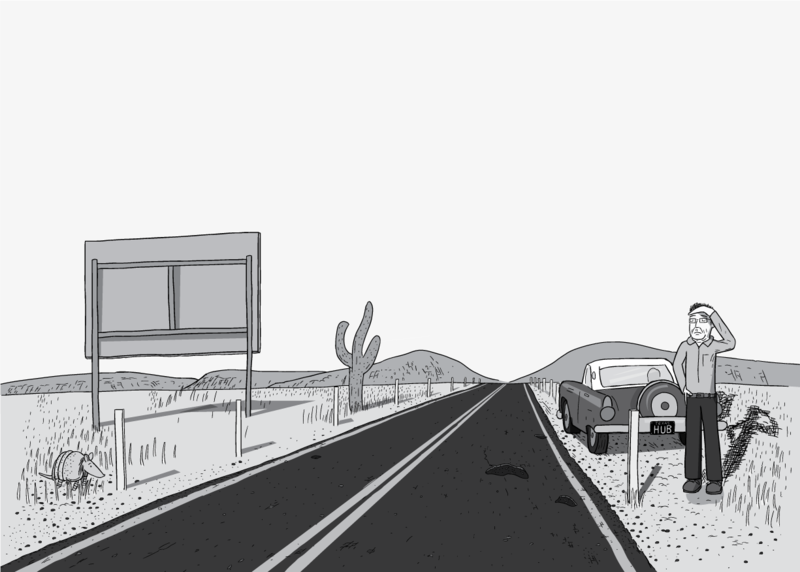 In other words, I chose not to illustrate the story with a series of disconnected ‘postcard’-like shots of pumpjacks, oil barrels and filling nozzles. I realised it is far more engaging to have a central character that readers can follow throughout the comic. I also decided that Hubbert should be more than a generic character in my comic. I decided to write a narrative that gives a specific reason for Hubbert himself to be shown in the comic. A great resource for my research was for this was the 33-hour oral history interview that Hubbert gave to Ron Doel in his final year of life. It took me 19 hours alone to read the transcript of this single reference source. I was astounded by the memories that Hubbert could still sharply recall, despite being aged 85 years. For example, he could still recall the names of specific textbooks and lecturers that he encountered at university. Ron Doel says that Hubbert’s 33-hour interview is much longer than the average oral history conversation that scientists tend to give. 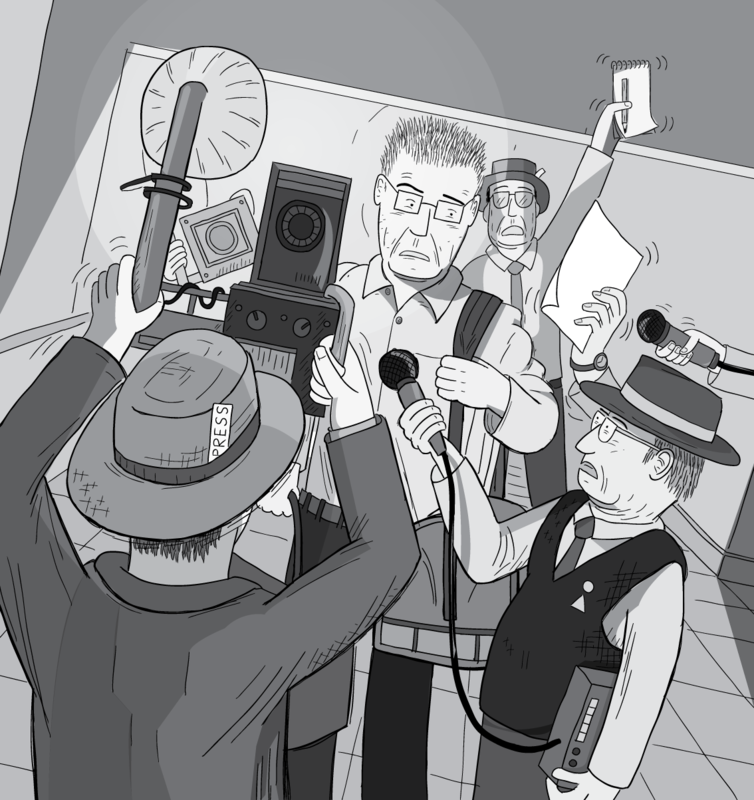 In preparation for his death, Hubbert seemed keen to get his papers in order, and leave resources for future researched who hoped to understand his career’s work. Thank you King Hubbert! I began to hone in on some of the ‘human moments’ that that were specific to Hubbert’s career. These formed important touchstones of the comic. 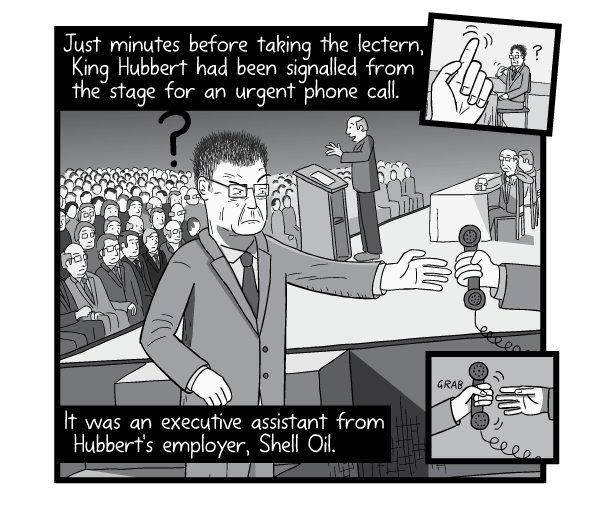 Example moments that I included in the comic include Hubbert being called off the stage for a phone call with a Shell manager, and also, the story of Hubbert being approached by journalists when he arrived in his San Antonio hotel. These are the ‘softer’ moments that surround the hard science. And unfortunately, it is these soft moments that are largely omitted in most explanations of Peak Oil. Most writers coldly explain the concept of Peak Oil with impersonal statistics about oil reserves and drilling techniques. They mention Hubbert’s name in passing, and then parade an endless series of graphs and bell curves. Graphs and bell curves are necessary for accurately understanding Peak Oil, but they are something I aimed to avoid with my comic, which I see as a mass audience ‘primer’ into the topic. I aimed to make graphs a minor and infrequent part of the comic. One way I did this was by creating the ‘roller coaster analogy‘. This is something that I invented, as I had not seen Hubbert, nor any other Peak Oil writer use the analogy. But it suited my purposes as a comics artist. 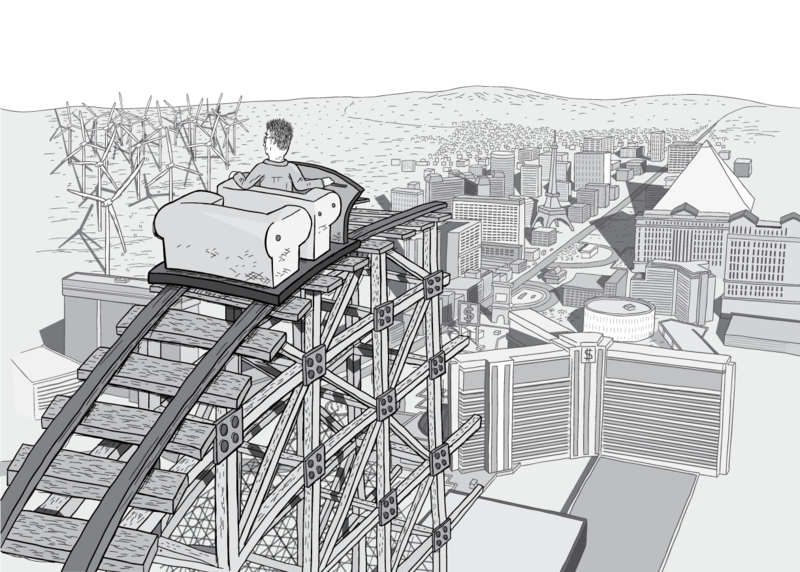 The roller coaster is an appealing way to display a ‘graph that is not a graph‘, and minimise the chance of readers tuning out in boredom. 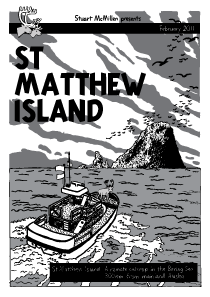 This is a trademark of my storytelling, which I have used with my comics from St Matthew Island (2011) onwards. Here’s my trademark: I deliberately avoid concluding my comics with PSA-style ‘messages’ that prescribe how readers should think and act. 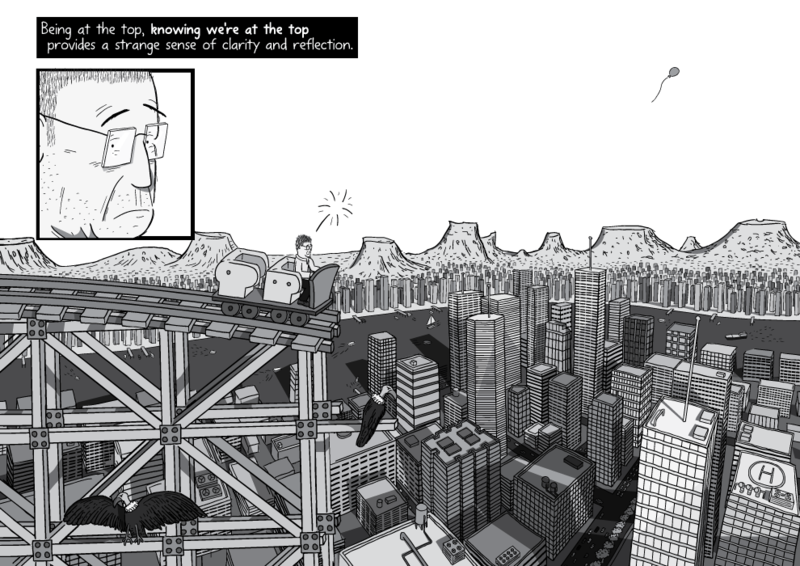 My comics are designed to be imaginative, and to encourage rumination and personal reflection. 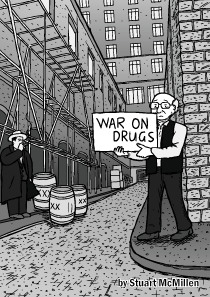 If I were to conclude my comics with a definitive full-stop, there would be no need for readers to continue their own personal journeys of thought and research. They would simply hop to the next content morsel in their internet feed. 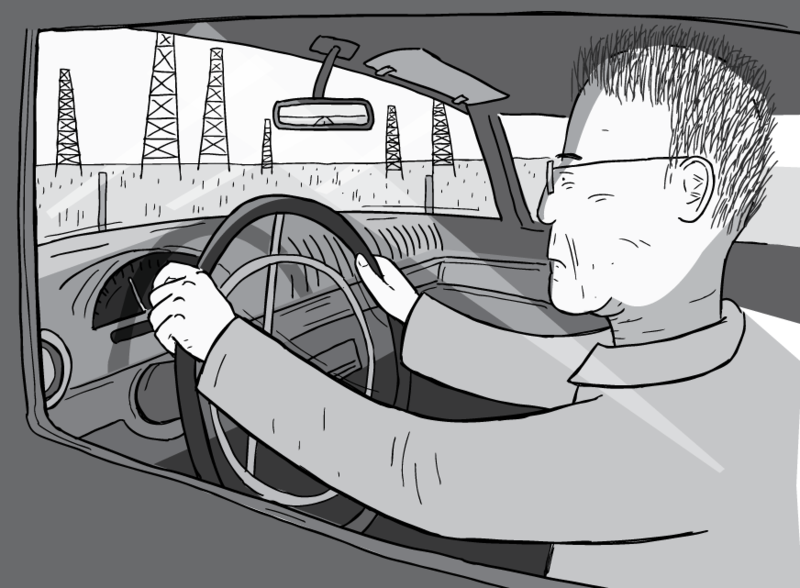 I have personal views about the implications of Peak Oil, and its importance to our society. 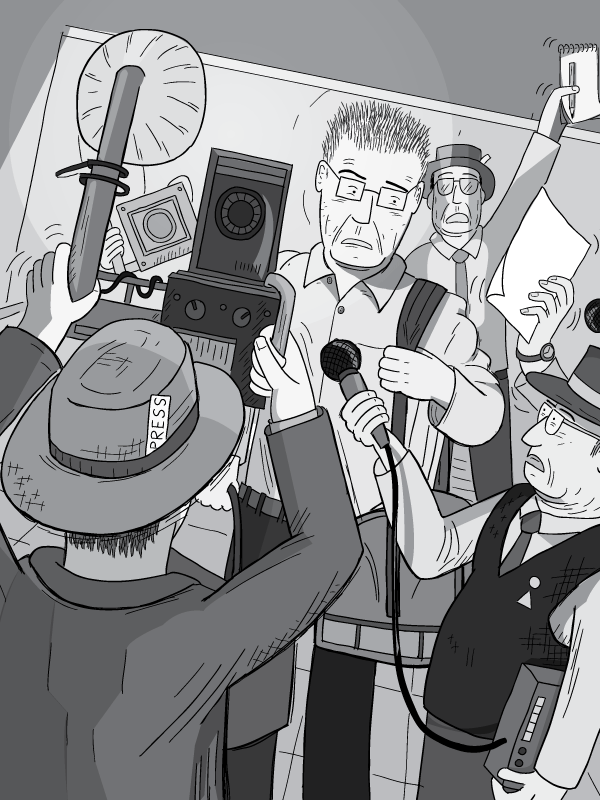 Accordingly, I tried to steer readers in a certain direction with the facts of my comic. For example, the statement “There is no doubt that global Peak Oil will certainly happen” hopefully eliminates many avenues of possibilities in the minds of readers! However, I remained deliberately coy with my overall summary about how readers should think and act immediately after reading my comic. That, I left up to the individual. 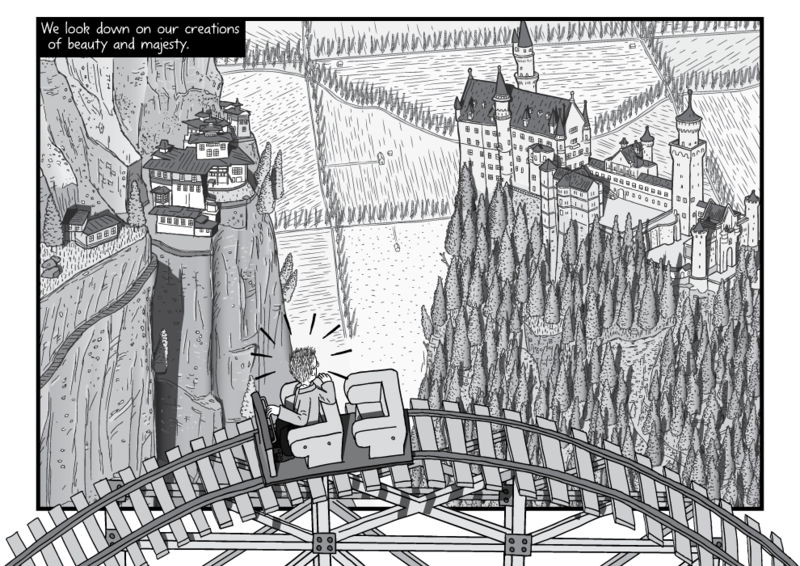 This is the second in a seven-part series covering various aspects of the comic’s creation process. 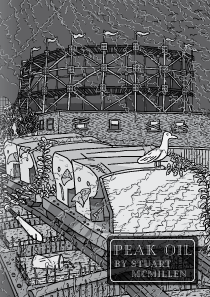 Next in the series is The making of Peak Oil #3: snags and delays.